In 2014, the singer and songwriter of an indie rock band called Mountain Goats, John Darnielle, took the literary world by storm with his debut novel, titled Wolf In White Van, an offbeat tale of a high-school misfit, told in reverse chronological order and, at times, through the context of an online roleplaying game. With his new novel, Universal Harvester, Darnielle again spins an unusual story with an even more unusual narrative. Universal Harvester is set in a small town in Iowa in 2000—specifically, the twilight of the era in which people could still rent movies on video tapes. A young man working in a rental store, Jeremy Heldt, begins to notice an odd phenomenon unfolding: customers begin turning in copies of movies which seem to have clips from . . . something else . . . recorded on them from older movies such as Peter Bogdanovich’s Targets (1968) on up through then-recent flicks such as She’s All That (1999) and Reindeer Games (2000). That “something else” is a series of increasingly disturbing footage showing what appears to be taken from inside a barn at an isolated farmhouse not far from Jeremy’s hometown. There are glimpses of a person apparently being held hostage, with a sack over her or his head, sometimes sitting on (or standing in front of) a chair, and at one point, being kicked while lying on the ground. These scenes are immediately reminiscent of numerous horror films, including The Ring franchise and Sinister (2012), both of which involve terrifying images captured on home video. But unlike those films, there is no entity or force which comes crawling out of TV screens to terrorize the protagonists. In fact, the horrors of Universal Harvester begins and ends with those video clips. 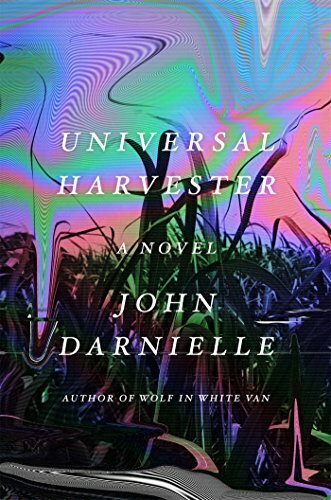 Far from a genre novel, at least in any broad definition, Universal Harvester’s exact nature is quite difficult to pin down. For its first third or so, the majority of the narrative is spent describing Jeremy’s place in life (namely, through his interactions with his father, his boss at the video store Sarah Jane, and his friend/crush Stephanie). Yet it’s with the second third of the book that things get switched up considerably. The narrative takes a sharp jump back in time (and place) to describe the meeting, courting, and early marriage of a couple of people, who will go on to become the parents of one of the characters of the book. Although this shift does bring an intriguing and charming development to the story, it is also a bit abrupt, and may come across, to the frustration of some readers, as a bit of an expository dump. There are also a few other literary devices which Darnielle utilizes that may not always fly for the reader in the final product. Although generally told in the third person, there are a number of postmodern overviews of events unfolding (at times analyzing certain scenes as being “versions” of how things went). What’s more, on occasion, a narrator drops in with a first-person perspective of the story, traveling somewhere between omniscience and being an unidentified character within the story. The novel’s mercurial prose may take some readers out of the reading experience, but then, this style is a bit of an acquired taste. Finally, of note is the book’s presentation. Technically a small paperback, it is housed inside of a plastic VHS tape case, complete with “be kind, rewind” stickers. If nothing else, the book will certainly make for a unique addition to bookshelves, if not readings, everywhere. Perhaps this book isn’t for everyone. Perhaps it doesn’t always succeed in achieving what it sets out to do. This will no doubt be a polarizing read, but perhaps that’s exactly what Mr. Darnielle put pen to paper to create.